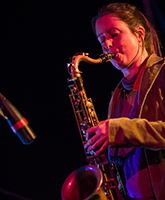 Rachel is a saxophonist, improviser and composer living in London, UK. She is involved with a variety of improvisation-based projects. One of these, a trio featuring Liam Noble and Mark Sanders, has just released an album on Babel Label. She collaborates in a trio with Julie Kjaer and Hannah Marshall, a trio with Steve Noble and Carl Ludwig Hübsch, and has performed in improvised settings with a variety of artists such as John Russell, Olie Brice, Rowland Sutherland, Alex Ward, Mary Halvorson and Han Bennink. Rachel is one half of Musson/Mwamba with Corey Mwamba. Superior out sounds, for sure.